Church ordered Philip's body to pulled up to higher ground to begin the act of his mutilation. His body was beheaded and dismembered. Quartered, Church picked four nearby trees and ordered four pieces of philip's body to be tied to them for the birds to pluck. His hand was given to Alderman as a trophy of the kill. Philip's hand was very unique. It had been disfigured when a pistol misfired years before. Alderman took the mamed hand happily and later would place it in a jar preserved with rum. Alderman would take the jar to taverns where he would allow the owners to display it in exchange for free drinks. Philip's head was spiked and proudly carried through the steets of Plymouth before it would meet it's final resting place upon Plymouth Colony Fort, now Burial Hill Cemetery. It would soon be joined by the heads of Chief Anawan and Tispaquin. How long the other Wompanoag leader's heads remained displayed on the fort is unknown. But we know that Philip's head remained on the fort for at least 25 years. As if sight of Philip's skull was not horrific enough, one day Cotton Mather removed the jawbone, to keep "the devil from speaking from the grave." The Sachem Squaw Princess Weetamoo was a powerful woman--even before she became the wife of Philip's brother Alexander. The union of Alexander and Weetamoo was a very strong one. The strength created in the marriage of the Pocasset and Pokanoket tribes was no secret to the English and no doubt contributed to the suspicions toward Alexander which led to the conspiracy of his death in 1662. Weetamoo died in what is now Bridgewater, Massachusetts toward the end of the war. She was attempting escape across a fallen tree over the Taunton River when she allegedly slipped in the river and drowned. When her body washed ashore, it was beheaded. 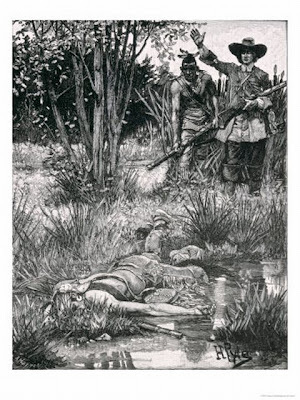 Just before the death of Weetamoo, many of her Pocasset people were taken prisoner out of the Hockomock Swamp where they were taking temporary refuge from the Colonists. They were so frightened upon capture, that they surrendered without a fight. After all, these were not warriors. These were tribe's women, children and elderly. And they were weak from hunger and travel. The prisoners were marched to Taunton where a gully served as their jail. They were then forced to bare witness to the horror of the parading of Wetamoo's head upon a spike back and forth in front of their disbelieving eyes. Pometacom, Metacom, Metacomet, Philip, and King Philip. These are all the names of Massasoit's youngest son who's name struck fear in the hearts of the colonists. The man we know commonly as "King Philip" in history was born Metacom, of the Pokanoket Tribe of Narraganset Bay. "Pometacom" was most likely a combination of "Pokanoket" and "Metacom." Perhaps there was another Metacom in a nearby tribe and the "Po" was added to avoid confusion. In 1660 the great Chief Massasoit died, leaving two sons, Wamsutta, the eldest and the much younger Metacom. Very soon after Massasoit's death, Wamsutta and Metacom traveled to Plymouth Colony Court with a special request: To be appointed English names. On June 13, 1660, Wamsutta officially became "Alexander" and Metacom, "Philip." Wamsutta believed that by changing their Native American names to English ones that the colonists would be less threatened by the two mighty brothers. I believe this act was an honest attempt to prove that Alexander had fully planned on remaining on the same peaceful path as their recently deceased father. Unfortunately, the name change did little to dilute the poisonous paranoia growing inside the colonists now that Massasoit was gone. Two years later, Alexander would be hunted down by leader of the Plymouth Colony militia, General Josiah Winslow. General Winslow had orders to find Alexander and bring him to Plymouth Court for questioning. By shear luck, Winslow stumbled upon Alexander's hunting party on White's island in Halifax (present-day Route 58 between the Monponsett Twin Lakes) as he traveled south from his Marshfield home. Winslow never anticipated that finding Alexander. It's no doubt that this simple capture strengthened the belief that God's work was at hand in helping the colonists in their manifest destiny. Alexander, his wife Wetamoo and his child were all marched down Satucket Path back toward Winslow's homestead. Alexander would never march the way towards home again. He died leaving Winslow's house. According to Winslow, Alexander was simply questioned about his motives toward the colonists, fell ill and was then released. To Wetamoo, Alexander's death was no act of nature. It was murder, plain and simple. Alexander's death helped precipitate King Philip's War as the monument at the corner of White's Island Road and Route 58 proclaims. This left Metacom as the leader of Wompanoags. Though Metacom attempted to retain the peace his father had worked so hard to achieve with the members of Plymouth Colony, history repeated itself around 1665 when Philip was called, just as his brother had been, for questioning by the Plymouth courts about Philip's (imagined or real) conspiracy for war. Of the request to appear in front of colony officials, Philip responded: "Your governor is but a subject of King Charles of England. I shall not treat with a subject. I shall treat of peace only with the King, my brother. When he comes, I am ready." To the English, this was absurd. That Philip would regard himself on the level as the King of England spurned the colonists to dub Philip "King Philip." Some Historians believe Philip earned the nickname "King" for another reason. Legend has it that Philip would often be seen walking the streets of Boston dressed in the finest English clothes the city had to offer. One Bostonian observed King Philip walking down a city street one day and described him thus: "His coat and buskins were thickset with beads in pleasant wild works, and a broad belt of the same. His accouterments were valued at twenty pounds." Twenty pounds is about $2,000 to us. KING PHILIP, HIS MAJESTY, P.P. King Philip was not known as "Metacomet" until after 1820 when Washington Irving published "The Sketch Book of Geoffrey Crayon." In it was an essay entitled "Philip of Pokanoket" where Irving refers to Philip as "Metacomet." It is after publication of this book that Philip is referred to "Metacomet" in subsequent literature. Through a grand old iron gate on the grounds of Brown University's Heffenreffer Museum of Anthropology lies one of America's most important archeological landmarks: King Philip's Seat, a huge rock outcropping in Bristol, RI that once served as the "royal seat" of the Chief of the Wompanoag people. It was here that King Philip held his tribal meetings at the base of mountainous rock, while the top served as a lookout. The rock remains unchanged since it was used by King Philip over 350 years ago. 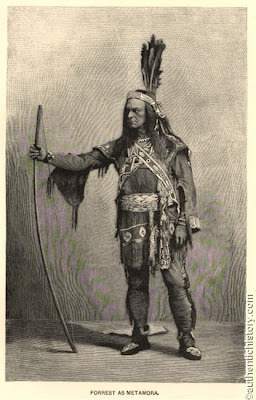 Prior to the time preceding production of the 1829 play, "Metamora, Last of The Wampanoags," Native Americans were viewed as heathen, dangerous savages. Metamora's hero was an unlikely one: King Philip, otherwise known as Metacomet, the great Wampanoag Chief who waged a war on New England so barbaric, that to this day it is still considered to be the bloodiest war ever to be fought on American soil. At the turn of the 19th century, American theatre was in its prime. There was one major problem though -- American actors were performing the plays of English playwrights. The need for American playwrights was at a premium, spurning American Shakespearean actor Edwin Forrest to organize a playwriting contest. The author of the best play would win $500, a handsome sum for 1829. The guidelines of the contest stipulated only three rules: the play must be a tragedy, it must be told in five acts and the central character must be an Indian. The winner was John Augustus Stone of Concord, Massachusetts. His tragedy, "Metamora, Last of The Wampanoags" would be an unprecedented, astounding, mind-blowing success, running in both American and English theaters for over 60 years, despite its unusual hero. In January, 1830 Stone wrote the following in The American Commentator: "A few years ago a play of any sort would have been looked at as "strange, unusual prodigy." Anglo American (Native Americans) were considered barren of interest and the dark history of the despised and heathen aborigines, the their own fastness,--absolutely unapproachable. The magnificent offer of our tragedian, an ardent love for my country, and a deep interest in its literary reputation have induced me to exert my humble talents in endeavoring to draw from the long neglected scenes of early American warfare --to extricate from the rubbish of tradition of prejudice, some of the ore of truth and to arrange the products of my research in dramatic form...I flew from the Canadian frontiers to Mount Hope and archives of old, having finally been put on the track by Washington Irving and the authors of Yamoyden of which service I make grateful acknowledgement." But the story behind the tragedy of Metamora is far more tragic. It is a tale of greed, pride, suicide and guilt all told in the shadow of a major turning point in American history: When American opinion toward Native American culture shifted from fear to fascination. The view of The American Indian finally broke out of its old evil mold and moved right into its current American stereotype. It was during this era in American history that the "Tonto" version of an Indian was birthed.